3600 Watt Generator is rated 4.7 out of 5 by 367. Rated 5 out of 5 by KarlFarmer from Ran multiple appliances for 12 hours straight!! We just went through a devastating Hurricane, Hurricane Harvey, and were in desperate need of electricity. 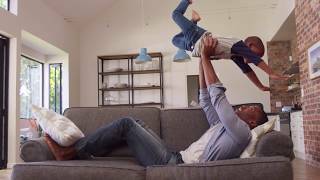 We were fortunate enough to have the Ryobi 3600 Watt Generator on hand to make our family feel safe. With this generator we were able to run our deep freezer, full size refrigerator, a/c unit, big screen tv, tower fan, 2 lamps and microwave for 12 hours straight! I was blown away with how long it ran on one tank, I honestly thought I'd be getting up in the middle of the night to refill the tank, but I never had to, it ran all night! My family was able to enjoy a much needed full nights sleep after riding out the storm - we couldn't be happier! Rated 5 out of 5 by Ray119 from Easy to assemble, great on gas, easy to start, During one of our recent snow storms in the northeast we lost power for 4 days. My 102 year old mother requires oxygen 24/7. I was able to purchase this generator just as her backup oxygen was running low. I opened the box, installed two feet and two wheels, added the included oil, and added gas. One pull on the starting cord and I was up and running. The generator ran for the better part of 3 days stopping only to add gas. What a life saver! What a great product. I kept the oxygen generator, refrigerator, the television and a number of lights going the whole time power was out. Rated 3 out of 5 by Gary802 from Poor Start/Good Ending At the outset, the generator would not start. Tech support helped me troubleshoot over the phone and admitted that there have been problems with the fuel lines coming from the factory. They would not send me a replacement fuel line, and informed me that if I bought one off the shelf and installed it myself, that this would void the warrenty. My only choice was the load the generator back into my truck and bring it back to Home Depot for service. Home Depot did the repair and now it works fine. My only other comment is that this generator is very heavy and while it is on wheels, loading and unloading, is really a 2 man job. Rated 5 out of 5 by JonnyD from Great Reliable Product! Bought this about a month ago during a power outage (20°). Very easy and quick setup about 10 min. with frozen hands. Was able to run multiple high watt electric heaters and several lights. Had confidence to run my refrigerator if I had to also. Noise level is acceptable and fuel efficent. Stored in unheated garage for a little over month, went to use it and it started right up on second pull. No complaints seems like a durable, well made, and hopefully long lasting generator. Rated 5 out of 5 by Happy Camper from Exceeded expectations I bought generator during extended power outage due to wind and snow storm. I needed immediate power for home furnace and refrigerator. I was able to have power with in 20 minutes of unloading generator at home. Machine was very simple to assemble, start up instructions were clear and simple, generator started right up and ran beautifully for 3 days until power was restored. Not a problem at all. Features were also Excellent with outlet plug capability and labeling. Built in voltage regulator for clean power to home appliances. I had used other generators prior and anticipated start up and running issues but was pleasantly surprised at ease of set up trouble free operation. I not only ran my home but also hooked up neighbors also....Awesome. Greatly exceeded my expectations and would highly recommend this unit. Rated 4 out of 5 by countydoc from Short time user I bought this unit to supplement another generator because of a recent power failure and I had multiple freezers and fridges to keep online. I liked the overall looks and design. One con was there was no true fuel cut off and to drain the gas from the unit was kinda of a pain.It's such a close fit under the tank to access fuels line so I wound D/C under the tank, which was messy. It was quieter than most generators, the handle made for easy moving it around, and starting was an ease. I did return it because I needed a 220v outlet for a well pump. I'm looking at next size ,6500. Rated 5 out of 5 by billg123 from Super help when really needed! We were one customer among 100,000 ComEd customers out of power from a blizzard in the Chicagoland area in November 2018. Temperature dropped to 14 degrees farenheit and we had a 3 year old in the house. Bought this generator and found that minimal assembly was fast & with easy to follow instructions. Out of the box, it actually started with one pull. Ran furnace first, followed by refrigerator, & power strip giving us main TV, internet, multiple phone and game chargers, DVD player, and all the indoor Christmas lights. We ran for a number of hours with no issues of any kind. Fuel consumption was also low. Love it. Emailed a friend "let it snow, let it snow, let it snow". We are ready. 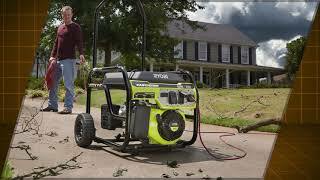 The RYOBI 3600 Watt Portable Generator with EasyStart technology is where efficiency meets convenience. With a Heavy-Duty 212cc OHV engine, this generator delivers 3600 Running-Watts (4500 Surge/Starting-Watts) and is powerful enough to be used on a jobsite or as an emergency backup system. Featuring the EasyStart 3-Step starting system and a large 4 gallon fuel tank, the RYOBI 3600 Watt Generator can run up to 10 hours at 50% load. The Quick-Release handle provides easy and compact storage while the flat-free wheels and the Hand Truck Frame design allow for easy transport, even over rough terrain. This generator is also equipped with an Automatic Voltage Regulator that provides consistent power. The Control Panel features (4) 120-Volt 20 Amp outlets and (1) 120V AC 30 Amp RV receptacle to meet all your power needs. All backed by a 3 year warranty, the RYOBI 3600 Watt Generator is guaranteed to perform.